In one week I will be teaching Disruptive Technologies for the first time at Stony Brook. My enrollment is lower than I had hoped and that has me a little concerned about how I will have to rethink my course design. I was reminded yesterday to embrace the lower than expected enrollment and to not wish for the alternative — too many students. I suppose that is true, but my design is predicated on teams and only having enough students to form two of them has made me question a few things. I think I have made the right kinds of changes so far to manage it. We’ll see. Setting that aside I am extraordinarily excited to get back in the classroom for the first time since the Spring of 2012 when I co-taught Disruptive Technologies for Teaching and Learning with my very good friend and colleague, Dr. Scott McDonald at Penn State. Back then it was a graduate seminar that was a popular offering in our College of Education. If I’m honest, teaching it alone without Scott to lean on also has me nervous. In a lot of ways making myself nervous is part of the thrill of teaching in the first place. So again, we’ll see. I get a lot strange looks when I tell people on campus that I am choosing to teach at all … most people tell me I am crazy. That is probably true given my time constraints, but when I look at the fact that my boss, President Stanley, is teaching this semester I think I can make time to make it work. When people ask me why I do it, the answers have been the same for years — I love it and I learn so much by doing it. I learn how the tools we provide for faculty really work. I learn how our classrooms really support instruction. I learn where our administrative tools are falling short and exceeding expectations. I learn about how our students see the services we provide. I learn from the readings we do. I learn as we form into a learning community. I learn about all the things that I have long forgotten about how hard it really is to be a college student. I just learn. An interesting twist this semester is that a member of my senior leadership team is taking the class as a student. When he told me I looked at him like he was crazy — I mean the guy finished his undergrad and has an MBA, so he clearly doesn’t need the credits. What he told me made me smile — he wants to learn. He wants to learn from what we do in class, but in so many other ways he wants to learn about what it feels like to be a students at Stony Brook and have to interact with all the systems our students have to interact with to be a student. His team builds the administrative information systems that support things like bursar functions, HR functions, registrar functions, and all the systems that really make a Unviersity work. He wants to know how his audiences feel … I liked that answer. He and I just want to learn. And that is what I love about this whole thing — teaching to learn. It was about this time last year that we rolled out SB You on campus. I have tried to keep a bit of a pulse on the service and overall utilization. While I have been a little disappointed in how broadly the service has been adopted to support teaching and learning, I am very excited by both the numbers I do see and the potential I think a platform like this affords. I have been trying to track the number of sites and users throughout the year each month (admittedly I have missed a couple). The growth is impressive — especially since we have not focused a lot of energy on blogging at the course level or for broader portfolio use. And yes, some of the sites are demo spaces or have been abandoned, but the growth has been solid. 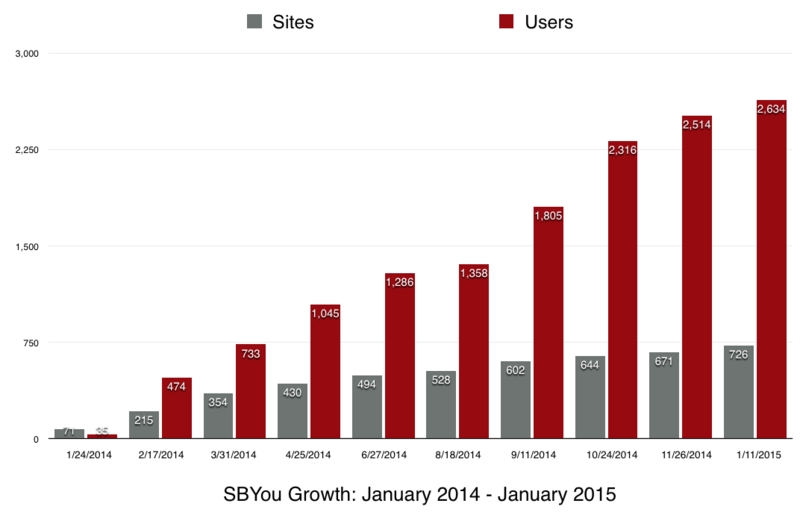 Check it out … in a year we’ve gone from zero sites and users to 726 sites and 2,634 users! We always see a spike at the start of new semesters, so I expect these numbers to really grow in the next few weeks. I have found some really good examples of SB You sites by lots of people and it would be cool for us to expose those on a regular basis. I think bringing various examples to life would show how diverse a platform it really is. I love how Campus Recreation and Healthier U have really embraced SB You as a platform, for example. I also really enjoy search the whole service for various terms and see waht people all across Stony Brook think about a specific topic … here is a linked search for the word, “technology.” That is pretty cool and there are lots of ways terms and tag searches can be used to discover what people are talking about across the Stony Brook blogosphere on SB You. I’d love to hear from users of SB You about what we could do to make the platform more useful and for ideas on how to better promote it. 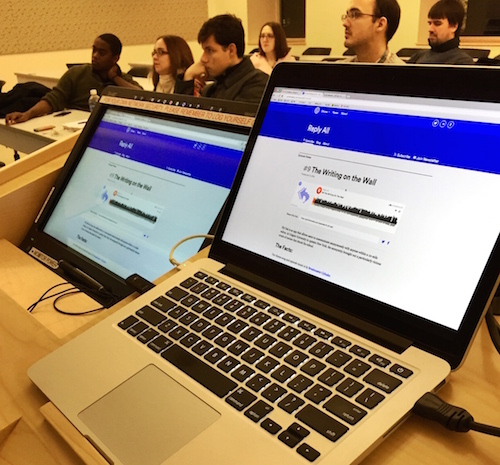 At the end of the day, I think platforms like this can and should power easy digital expression, broader acceptance of public scholarship, sites for clubs, organizations, and groups, and so much more.